Israeli soldiers fired, on Friday evening, many gas bombs at and near the Stadium in the al-Khader town, south of the West Bank city of Bethlehem, causing many players, and other Palestinians watching the match, to suffer the effects of teargas inhalation. The soccer match was between two teams consisting of players born in 2001 and 2002, from the al-‘Obeydiyya and Doha towns, in the Bethlehem governorate, when Israeli soldiers invaded the area, and fired many gas bombs into the soccer field, and the areas surrounding it. 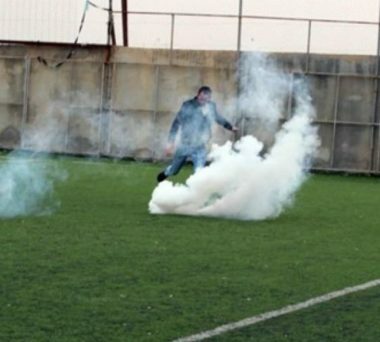 Medical sources said many players suffered the severe effects of teargas inhalation, and the match was postponed until further notice. The attack was not the first of its kind, as the soldiers previously detained many players, and fired gas bombs into the soccer field, also causing injuries.